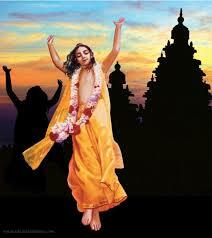 He was a very confidential associate of Sri Sri Gaura-Nityananda. In Gaura-ganoddesa-dipika it is stated that he is an incarnation of the effulgence of Srimati Radharani’s body, as well as an expansion of Purnananda gopi. Though he was one of the associates of Nityananda Prabhu, the majority of whom were cowherd boys and thus situated in the mellow of friendship, he was always absorbed in the mood of a gopi.